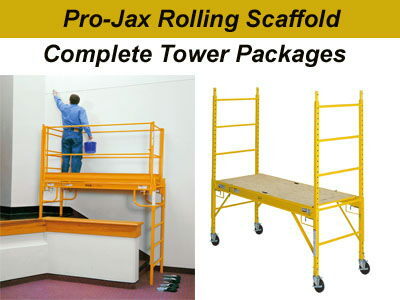 Bil-Jax Pro-Jax Utility Scaffold set with adjustable platform in 2" increments. Set includes 2 29"x6' end frames, 2 6' side braces, 1 plywood deck with steel frame and 4 5" swivel casters with locks. Load capacity is 1000 lbs. * Please call us for any questions on our scaffold set 6 foot x29 inch rentals in Portland OR, Gresham OR, Milwaukee OR, and surrounding metro area.